1. Yellen set to speak: Federal Reserve Chair Janet Yellen is scheduled to speak publicly in California on Wednesday. The event kicks off at 3 p.m. ET. Wall Street will be watching to see if Yellen drops hints about how the Fed views plans from President-elect Donald Trump to stimulate the U.S. economy and create jobs. She'll be speaking immediately after the 2 p.m. release of the Fed's Beige Book for January. 2. Earnings: Citigroup (C), Goldman Sachs (GS) and TD Ameritrade (AMTD) are releasing earnings before the open. Investors will look to see if the results match last week's solid reports by JPMorgan Chase (JPM) and Bank of America (BAC). Bank stocks have rallied since the election, boosted by expectations of fewer regulations and rising interest rates when Trump becomes president. Meanwhile, Netflix (NFLX) plans to release earnings after the close. Last quarter, the firm announced it had added 3.6 million subscribers, shattering expectations. The company's stock hit an all-time high last week. 3. Wilbur Ross hearing: The Senate is holding a hearing Wednesday morning to decide whether to confirm billionaire investor Wilbur Ross as commerce secretary. Ross is known for buying up distressed and failing companies. He made a name for himself acquiring troubled assets in the steel and coal industry, but has focused more on banks since the 2008 financial crisis. The Senate's hearing for Tom Price, Trump's pick to lead the Health and Human Services department, is also on Wednesday. Price, an orthopedic surgeon, is an ardent critic of Obama's Affordable Care Act. 4. Muddled markets: There's a distinct lack of direction in the markets right now. 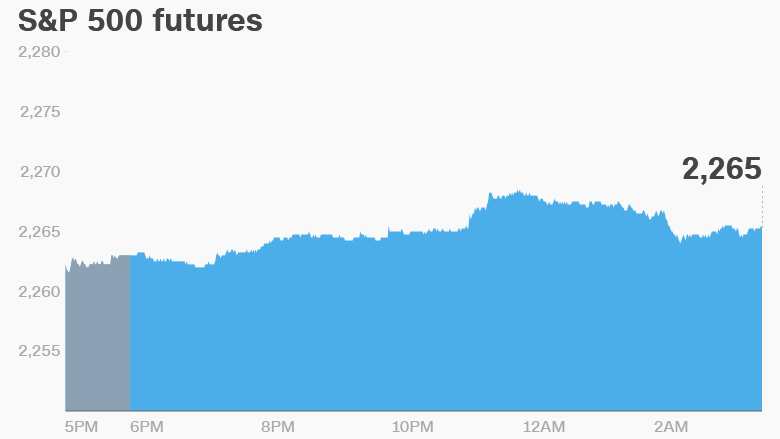 U.S. stock futures are holding steady. European markets are mixed in early trading. Asian markets are ending the day with varied results. This comes after all the major U.S. indexes dipped on Tuesday. Dow Jones industrial average and S&P 500 dropped 0.3%, while the Nasdaq slipped 0.6%. 5. Trump-inspired inflation? : Wall Street is betting Trump's economic plans will push inflation higher. New numbers from the Bureau of Labor Statistics are expected to show that consumer prices rose by about 2% last month compared to the same time last year. The report is out at 8:30 a.m.